Disclosure: I received a sample DVD to review. No other compensation was received and all views expressed are my own. My kids love trains. Seriously. But in all honesty, what kid doesn't love them? They're big, noisy, and awesome. We're always excited when there is a new adventure with our favorite Chuggington engines out on DVD, and this new release has arrived in time to be a perfect stocking stuffer! Featuring five special episodes that are loaded with fun and heartfelt lessons for little ones, Chuggington: Snow Rescue is train-tastic winter fun just waiting to happen! Lincoln's favorite episode on this DVD is Snow Rescue - he keeps asking to watch the "Christmas Chuggington!" Addie also likes this episode - they're both pretty obsessed with Christmas lights, so the holiday parade put on by the Chuggers is quite entertaining for all. This DVD is a definite new favorite for winter in our house and I'm so happy we'll have it to help survive the cold, long months ahead. 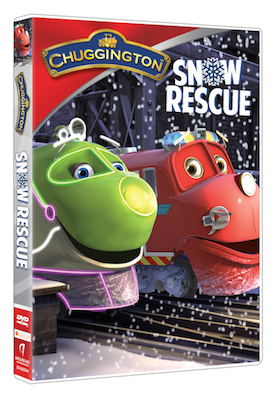 One Director Jewels reader will win a Chuggington Snow Rescue DVD! This giveaway will end on December 31 at 11:59pm CST. This giveaway is open to US readers only. Winner will be emailed and will have 48 hours to respond or prize will be forfeited. Disclosure: I received a sample DVD for review. No other compensation was received and all views expressed are my own. For more information, you can read my Giveaway Policy and my Disclosure Policy. I have no idea, this is something my son watches with his daddy! But I know he loves it! Wilson is our favorite - he is always getting into mischief! I like Old Puffer Pete! My son LovesKoko. Wilson is my favorite train. I like Brewster. Chuggington is on Netflix now and we have been watching it a little too much! My boys like Brewster the best. I think my grandson likes Wilson. He has one of them and a movie. I would like to give him this one. I am not familiar with Chuggington. but I know my niece will like this - she loves trains! I don't know the Cuggingtons either but my neighbor's grandson loves them. So I am going to be a first time Grandma so I would love to have it for our baby to watch later on when he/she gets bigger. Our favorite engine is Wilson!